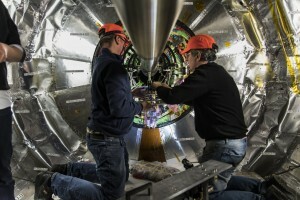 There’s a piece of linear collider detector technology that is getting ready to take real collision data. The linear collider may be at planning stage, but right in the middle of the CMS detector, a luminometer based on work done for the forward region of the ILC’s ILD detector is very much a working piece of kit. It will measure the luminosity in CMS, ie the rate of collisions that the LHC produces per second, and the beam-induced background. The luminometer, part of the beam radiation instrumentation and luminosity (BRIL) project at CMS, consists of the so-called pixel luminosity telescope PLT and another part called BCM1F. It’s the BCM1F, a DESY-CERN coproduction, that has its roots in the forward calorimeter. The forward calorimeter is located in a tough area that needs radiation-hard equipment in order to survive. 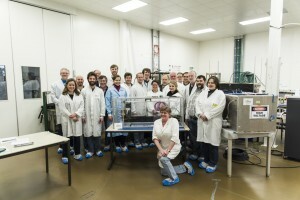 Already several years ago the FCAL collaboration tested several different technologies and settled on diamond sensors. It was actually during one of the test beam periods at CERN that the collaboration for the CMS luminometer was born when the LC FCAL started chatting to CERN experts on beam halo monitoring. Radiation-hardness isn’t the only thing that sets the BCM1F lumi tool apart: its sensors use diamond crystals that deliver ultra-short signals when a particle passes through. The application-specific integrated circuit (ASIC) to amplify the signal, developed and commissioned by a team from AGH-UST Cracow, CERN and DESY (Zeuthen), takes only a few nanoseconds to be back online, making it possible to count particles that pass through at very short intervals. Physics can deduce whether the particle comes from a collision or from beam background based on the time they passed through. The luminometers were installed in CMS in January. The setup consists of two semi circles with an outside radius of 10 centimetres. They sit at 1,8 metres distance from the interaction point and, once the LHC starts up again, send their information about luminosity and particle count from the beam-induced background to the CMS and LHC control rooms every second. Meanwhile, over at the linear collider’s FCAL, the FCAL collaboration will use the experience acquired in the operation of the CMS luminometers in the LHC’s run 2 for the construction of prototypes of forward calorimeters. ASICs experts will get to work on FCAL-specific integrated circuits with the help of funds from the AIDA2020 programme. So in true particle physics cross-fertilisation tradition the technology that started in the linear collider community will give its first performance in the LHC only to to be developed further with the experience gained from that first performance.